Visits: 127766 persons viewed this recipe. Kuboos or Khubz is an Arabian pita bread/flat bread/roti made with wheat flour or all purpose flour. Before, kuboos was more familiar for malayalees who had a Middle East connection. But now it is in for everyone. Given here is an easy to make recipe. Khubz is usually baked in hot oven, but here we are going to prepare it in a flat non-stick pan. Dissolve yeast in ½ cup of warm water (make sure that the water is not too hot) along with sugar and let sit for 10 minutes until it is frothy. Combine wheat flour, yeast dissolved water and salt in a mixing bowl. Gradually add 1 cup of warm milk and mix it well with your hands until a dough consistency has formed. The dough should be smooth and firm but not stiff (add more milk or wheat flour, depending on the absorbency of the wheat flour). Place the dough on to a lightly floured working surface and knead it well (approximately 5 minutes) with your hand till it is soft and smooth. The perfect kneading makes the kuboos/pita bread soft and puffy when it is cooked. 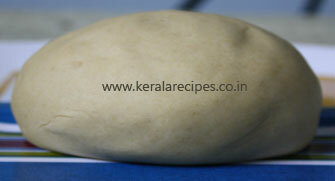 Return the ball of dough to a bowl and brush it with 1 table spoon cooking oil or ghee. Cover the bowl with kitchen towel or plastic wrap. Keep it in a warm place for minimum 2 hours and let rise until doubled in size. When the dough rises almost double in size, knead it briefly. Make 12 equal sized balls from the kneaded dough and keep it covered with the kitchen towel for another 10 minutes. Roll the balls like chappathi/poori to get round shape (almost double the thickness of chappathi/poori) using a roller/press by spreading wheat flour over it. Heat a flat non-stick pan on medium flame, place the kuboos on it and wait for a few seconds and turn it to the other side. This time you wait for little more time and turn it again. Now press it using a spoon as shown in the below figure so that it puffs up. Turn it again and press it. Remove from the pan when it puffs up. Keep it warm by covering it while cooking the remaining kuboos. Instead of cooking khubz in a flat non-stick pan you can also bake it in a pre-heated oven. Hi Smitha, You are right. Generally we won’t add milk in kuboos. But here I used milk for a better taste and softness. Definitely you can replace milk by water. Thanks a lot for sharing your feedback here. This is an easy way to make kubbus thanks a lot. Could you tell me whether the kubbus we get in the market is made of wheat flour or maida..
You are welcome Drisya. In the market usually we are getting kuboos made of all purpose flour (maida). But kuboos with wheat flour is also available in some places. Thanks for the comment. thank you. i will surely try your method for preparing it. Hi Drisya, hope it comes out well for you. Thank you. All your recipes are really good. Some of them I tried, my family liked it. Thank you. I would like to try out this new recipe. Hi Faijas, Thanks for the comment. Please do share your feedback if you happen to try this recipe. Hi Shaan, your recipe is so attractive. because your preparation is differ from others. kindly suggest which curry is more tasty with special kuboos. Hi Suresh, Thank you very much for the words of encouragement Kuboos goes well with gravy type curries like Chicken/Mutton curry, Egg curry, Potato curry, Mixed Veg curry etc. Hi Shaan, Thank you for posting this recipe. I always thought making Kuboos was a cumbersome job, tnx for a simple recipe, will definitely try it out. I really like it… Thanks a lot for you. This is a very nice recipe, I tried it at home. Thanks for this simple recipe of Khubz. It really came out well. I made hummus along with it and everyone enjoyed that. Hi Fouzia, It is pleasure to know that this recipe worked out well for you and all of you enjoyed it. Thank you very much for sharing your feedback. Can we make the dough and keep it in the refrigerator for one or two days and take out after that? Because I have a small baby I want to make the dough whenever I get time… will it work? Hi Febin, I don’t think that it will work out because the dough become overly fermented, lending a sour taste. Thanks for the comment. Hi Deepa, I haven’t tried this recipe with baking powder. Yeast and baking powder function in different ways. Baking powder rely on a chemical reaction whereas yeast is a microorganism. Usually we are using yeast for making foods in the bread category and it is a flavor enhancer too. So substitutions may not give you the end result that you want. If you got a chance to try it with baking powder please do share your feedback. Thank you very much for the comment. I read a post about using baking powder, use only a half pinch of baking powder along with yeast only for more puffiness, if use more baking powder kuboos become crispy. You are welcome Sunand. Please do share your feedback. Thanks for the recipe… but I want to do it with 1 glass of wheat flour. So is that the same amount of sugar I would be using? or what is the amount of water and milk to be added then? Hi Sanam, Thanks for the comment. You can reduce the quantity of other ingredients proportionally. I was Searching, Waiting, searching, waiting…… for long time for this recipe. Lots of thanks and happiness. I am a vegetarian who also does not take eggs in cakes, bread etc. I would like to know whether, by any chance, eggs are added in Kuboos produced in Kuwait or other parts of GCC. Thanks. Hi Sundar, Usually we won’t add eggs in Khubz. I am not able give 100% assurance that all the kuboos producers follow the same method. Better you check with the list of ingredients mentioned in the packets. I like your recipe and will try it. Thanks Rasheed. Please do share your feedback after trying this recipe. How to make it in an OTG? I tried your recipe and it was very tasty to have with Kadala curry. Good job. Thank you. Hi, I tried kubus earlier in preheated oven. It takes long so I switched to hot ladle. I am glad to see that you advise on the same and that affirms my method. Thanks. One day evening suddenly I thought of making kuboos. Your 9 simple steps really helped me. My husband also had a passion to tasty food. He enjoyed well. Thanx a lot. You are welcome Reena. It is pleasure to know that this place helps you to prepare kuboos and you both enjoyed it. Thanks a lot for the feedback. Hi Shaan, thanx for the recipe. Usaully I buy it from super market. Today I am going to make this. If it is success I will make it on Thursday for weekend party in park. Am staying in sharjah. Plz pray for the roti. Hi Afeela, Thanks for the comment. Hope it will work out well for you. Please do share your feedback. How can we prepare garlic paste to serve with kubboos. pls tell me the recipe. Midhun, Thanks for the comment. I will try to include the garlic paste recipe soon. All recipes are really nice & preparation also easy. Its similar some of our Bangladeshi food. I m trying to made it for my family & my malayali friends. Tania, Thanks a lot for your kind words of encouragement and also for taking time to share your comment. It is nice of you cook for your friends. Please don’t forget to share your feedback. So thanks to giving the information of ingredients needed for making the kuboose and for the recipe and my doubt is whether the kubz is dangerous to health. Kubra, Thanks for the comment. It is not dangerous if you use wheat flour for this preparation. Hai Shaan, I was searching for a simple n easy recipe on kuboos. Right now I have got in to it. Thankz a lot. Am going to try it. I wl send u the feed back. Sheeba, I am happy that you found what you are searching for. Hope it will come out well for you. Manjunath, It will go well with most of the gravy type curries. I usually have Kuboos with kerala chicken curry. Can we use soda powder instead of yeast? Sheeba, I am not sure that it will work out by adding soda powder. Usually Kuboos / Pita bread is prepared using yeast. Nice… our arabic bread.. we all enjoyed.. thank you sir for your simple recipe. Hi, my yeast is not getting frothy, so kuboos not increasing size. What should I do? Suda, If the yeast used is too old or if the water used to dissolve yeast is too hot, it will not get frothy. Hope this helps you. Hi, What is the cheese given with kuboos. I asked the servant what is this cheese? He told that mix of cheese and garlic. Can you explain how to make that. Raja, Kuboos usually served with the white sauces like mayonnaise, garlic paste, hummus etc. I will try to include the recipes soon. When I go to Lulu Mall in Edappally taste the Kuboos. I and my husband liked it very much. I think your recipe will help me for making Kuboos. Thank you Shaanji for sharing this recipe. You are welcome Rajalekshmi. Please try this khubz recipe and let me know which one you like most Thanks for the comment. I appreciate your interest in cooking. Keep going. Sure to try your kuboos recipe soon. Aisha, Thank you very much for your kind words of appreciation. See you here often. Am going to open kubboos factory in Kannur district. So please help me. Please send your number. Hello! 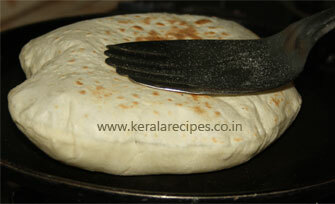 I must try out this… The Mallu type of making Khubz… While baking in the oven, what should be the temperature to be set? Also, do we need to preheat the oven, if so at what temperature…???? Geetha, Preheat the oven at 450 °F / 232 °C. Bake each Khubz about 4-5 minutes until it puffs up. Hey man, how long does kuboos stay fresh? like the one bought from lulu? Raj, Have it immediately for the better taste. It can refrigerate and store for few days. Thanks a lot. After long hour of searching I found a easy and simple recipe of kuboos. Yasira, Happy to know that you found what you were looking for long time. Please share your feedback if you happen to try this recipe. Zoya, Glad to know that the recipe work out well for you. Thank you very much for the feedback. Hi shaan, I’m planning to make shawarma tomorrow. Couldn’t find whole wheat khuboos. So going to try this one. Hope it turns out well!!! Thank u 4 posting the recipe. KK, Thanks for trying Khubz recipe. Hope it will come out well for you. Please don’t forget to share your feedback. Helloo sir, I like ur recipes. I am also passionate about cooking. I love cooking…M from Kerala and want to learn more about fuddZ…cooking…with the help of you. Thank u.
Jaseena, Happy to know that you love cooking very much. I will here to help you. Thank you very much for the feedback. Hai Shaan. A very Gud morning. I like ur recipe. First time I try it but finishing so so good. My husband give me reward 4 your recipe. I love it thank u so much. I expect more like that so pls share more recipe. Hi Shaan, I like your recipes. This is very interesting and I will try it soon. Thank u. Thank you very much Priya. Please do share your feedback. Usually kaboos available for Shawarma do not have brown spots on them. Is the recipe same for such Shawarma kaboos? Shabana, the kuboos available in the market do not have the brown spots as it is machine made. The recipe posted here is slightly different, we used the pan to prepare it. You can prepare it in a pre-heated oven to avoid the brown spots. Hi Shaan, Thank you for your recipe.